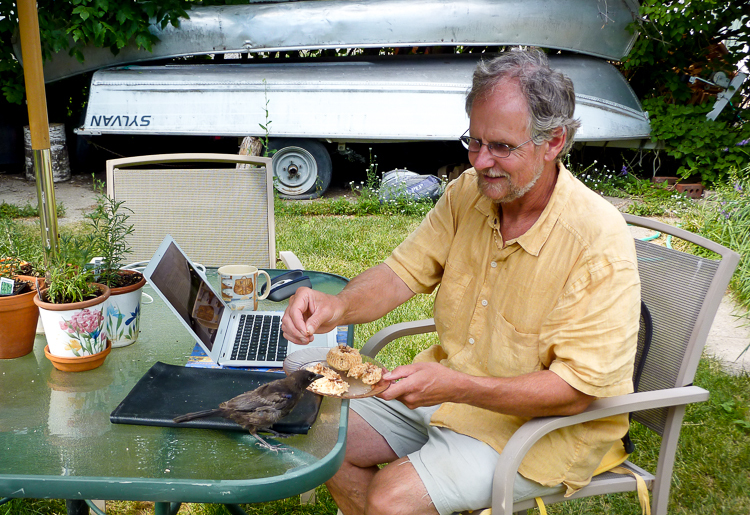 Hard at work on The Gray Ghost Murders, feeding a wild blackbird raised from a hatchling and later released. It returned a year later to visit and get a free meal. The only problem is that the publisher wants a series. Stand alone mystery novels, stand alone novels of any kind, have about as much chance of making money as I do of beating out Peyton Manning for the QB-one spot on the Broncos next year. But sell that first novel and you find yourself in the big leagues of a totally different sport, one that nothing in your life has prepared you for. The publisher takes you to lunch in the Village; she broaches the subject of the second book. When might she see it? And a week later you’re back home staring at a blank piece of paper or the electronic equivalent. You only had your entire life to write the first one; now you’re looking at a year for second. They like to keep these things coming. It’s the way to build a readership and after all, this is a business. That’s the conventional thinking, anyway. My own experience was that the second book, the Gray Ghost Murders,” which will be published less than a month from now, was the easiest. I was 20,000 words into the story when I got the two-book contract and never let myself feel the pressure and never looked back. I give myself credit for being smart about the head start, but luck was involved as well. I had a good premise, a hook, the bare bones of the story already in mind when I started it. And, and I think this is important, the first book had yet to be published. I was still in that period when it’s all a bit of a miracle. There was pressure, but it took the form of worrying whether the Royal Wulff Murders would sell or die a thousand deaths, taking me down with it. I didn’t worry so much about writing the second book. For me, the third book, Dead Man’s Fancy, was the tough one. Tough like “The Royal Wulff Murders” was but with this difference — I had a deadline. Dominick says one of the pitfalls of the second novel is the writer overthinks it, tries to outline, which is a joke (more on that in a future blog), and as a result becomes paralyzed. I made this mistake with the third book, which I began last spring. I didn’t become paralyzed, but I lost time and came to realize that I was in for a very hard slog. Such is the nature of professional writing, which differs from hobby writing in that your livelihood, not just your image of yourself, depend on it. As I write this, I’m about halfway through the rewrite. The deadline looms. Wish me luck. Thank you for taking time to blog about your experience. I very much look forward to reading about the trials and tribulations brought on when you tried outlining with your third novel. Best of luck in your endeavors! You definitely have this devoted fan!! I enjoyed your first 2 books and look forward to the next one. I read a variety of different books, but I’m drawn to outdoors series the most. My brother in law is a fly tier and fisherman who also likes to read. I plan on sending him an email telling him about your books. F r e s h. D a i l y. A r t.
Hi and thank you so much for the note!